Book review #2 of 2013! Those of you who continue to read my book reviews know that I always begin with lengthy intros that often deal with how I discovered/decided to read said book more than about the actual content. Though I understand that that may be boring for some of you, I actually find it rather fascinating how people come across the material they read- whether it's through word of mouth, or because you saw the movie trailer and you want to read the book before seeing the film, or if it's through browsing a bookstore completely at random. Those little tidbits fascinate a book lover like me, so I will continue to share them. If they bore you, I won't even notice if you skip it and go straight to the review. With that said, Delirium is a book I discovered through simply reading many books of the same genre. When you've read Matched (Ally Condie), the Uglies Series (Scott Westerfeld) and similar YA dystopian novels, you get accustomed to seeing them surrounded by familiar books. So though I never really got a personal recommendation for this book, I suppose I heard it through book association. If you read my 2013 Reading List then you probably saw it listed there. I came into reading this book with relatively no expectations whatsoever. I had no glowing (or any actually) recommendations from anyone, but also no one discouraging it either. So, without further ado, let's start on some actual content! "They say that the cure for love will make me happy and safe forever. And I've always believed them. Until now. Now everything has changed. Now I'd rather be infected with love for the tiniest sliver of a second than live a hundred years smothered by a lie." That is probably the most minimal back-cover description I have read for novels such as these. Because of that, I'll provide a bit more. As I stated earlier, I came into this book with few expectations, which often correlate more closely with low expectations as opposed to high. The covers of young adult novels always make them seem shallow and it's difficult to fight the first impression of physical appearances. I really wish they could just make better covers. The Hunger Games Series and Divergent/Insurgent have somehow managed this. 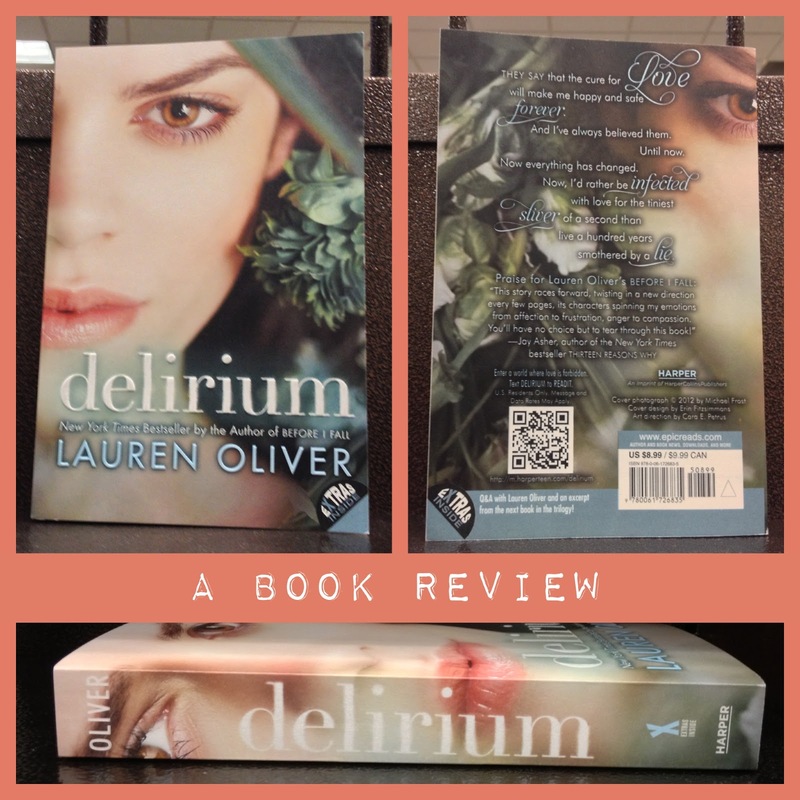 With Delirium I felt that the society was fabricated as a way to target the teenage audience. Unlike Matched, where the society is not only focused on marriage matching but nutritional values, physical fitness, and pills for stress-related issues as well, the fulcrum of Delirium is that love is a cancer. It seems to balance itself on that single premise, and because of this, I felt that it was conceptually a bit adolescent and simply looking to engage a young audience that is fascinated with the idea of what it means to be in love and what it feels like if you lose it. It's great for the melodrama of your teenage years. As I read to 75% of the novel, I found myself very pleasantly surprised. Yes, the novel maybe relied a bit too heavily on the idea of love as the cause of all war and evil, but the constant descriptions of how love really does feel like an infection that envelops you, makes you nauseous, and can ultimately destroy you, made me slightly nostalgic. For any person who has lost a loved one, whether it to a horrible break-up or the death of an immediate family member, we have probably all wished for that pain to go away. Yes, months following the immediate pain we may be grateful of the experience we had, but no feeling (not even ones I have felt to this day) compare to the shattering innocence of first heartbreak. Delirium makes you think about what life would be like if you had that option. It plays on the idea that war and evil emerges through the passion that equals love and the peace we can attain once that passion is lost. The characters in this novel were decent and fairly likable. I mostly liked Lena because she was a runner. Otherwise, she was rather bland. It makes me take back all the negative things I've said about Tris (Divergent). Yes, Tris was a bit whiny, but I'll take a whining, obnoxious personality over bland any day. Lena's best friend, Hana, almost mirrored Shay (Uglies) and because I really did like Shay, I felt favorable towards Hana. Even though the characters weren't entirely memorable, they fit with the story well and moved the plot in interesting directions. If you're a teen/YA dystopian novel lover like me, you will definitely get some enjoyment out of this book. I definitely plan on reading Pandemonium (Delirium Book #2), but since they are releasing the paperback (which essentially means cheaper) copy in early February, I will wait until then to pick up my copy and read it. Also, Requiem (Delirium Book #3) is scheduled to release early March which makes me even more excited! NOTD: OPI "Just Spotted the Lizard"
NOTD: OPI "Just A Little Rosti At This"